The Mallard is the most abundant, widespread, and familiar duck in North America. The breeding range extends across most of Canada and the northern half of the United States, and it spends the winter where it finds open water in the lower 48 states. The Mallard is most common in Tennessee during the non-breeding season, especially in West Tennessee, with peak numbers occurring from October through February. It is an uncommon breeding bird across the state. Hunters routinely refer to male Mallards as greenhead ducks and to females Mallards as suzies. Description: The male is easily identified with its iridescent green head, bright yellow bill, and curled short central black tail feathers. These curled tail feathers are unique to the male Mallard. The female is mottled brown overall, with an orange bill marked with black. Both sexes have red-orange legs, a mostly white tail, and a bright blue patch on the rear of the upper-wing that is bordered in white. Voice: It's the female that gives the characteristic quack and the familiar descending laughing series of quacks. Males make a softer, rasping rab during courtship. American Black Ducks look similar to female Mallards but are darker, have an all-dark tail, and have no white borders to their purplish wing-patch. Male Northern Shovelers also have a green head, but also have a large broad bill and a white chest. Other female dabbling ducks look very similar to the female Mallard, but the Mallard is the only one with a blue speculum bordered by white. Habitat: Ponds, lakes, and open and forested wetlands. Diet: Insects, aquatic invertebrates, seeds, acorns, aquatic vegetation, grain. Nesting and reproduction: Pairing among Mallards takes place in the fall, and pairs stay together all winter. Egg laying begins as early as late February and extends through May. The male does not participate in nesting activities after incubation begins. Clutch Size: Usually 7 to 10 eggs, but occasionally up to 15 eggs. Fledging: The young leave the nest within 2 days of hatching and are able to fly in 8 weeks. Nest: The female builds a bowl of grasses and other plant material, and lines it with down feathers from her breast. The nest is placed in a fallen log, on a small island in a marsh, or under a dense bush near water. 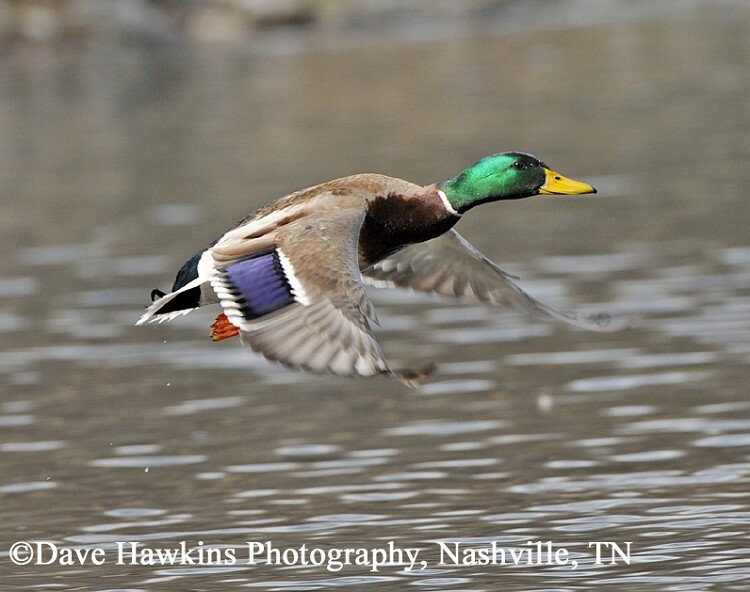 Status in Tennessee: The Mallard is common in winter (October through February) across the state, especially in Middle and West Tennessee. It breeds in all parts of the state, but is not common in any region. 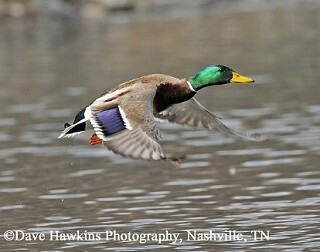 Historically the Mallard was a rare breeding bird in Tennessee. It is thought that the current breeding population is descended from crippled wild ducks, escaped domestic ducks, and ducks stocked by waterfowl enthusiasts and conservation agencies. The Mallard is the ancestor of nearly all domestic duck breeds (everything except the Muscovy Duck). Many of the domestic breeds look like the wild birds, but usually are larger. The Mallard is the most abundant and widespread of all waterfowl; every year hunters harvest millions of birds with little effect on the overall population. The greatest threat to mallards is habitat loss. Mallards hybridize with wild species such as the closely related American Black Duck and even occasionally with Northern Pintails. The oldest known Mallard in the wild was 27 years 7 months old. Best places to see in Tennessee: Most abundant in the state from October through February especially in Middle and West Tennessee. Can be found at most waterfowl refuges across the state. Hundreds to thousands spend the winter in and around Reelfoot Lake. Drilling, N., R. Titman, and F. McKinney. 2002. Mallard (Anas platyrhynchos). The Birds of North America, No. 658 (A. Poole and F. Gill, eds.). The Birds of North America, Inc., Philadelphia, PA.